"Good Morning America weekly contributor Tory Johnson spent decades failing at every fad diet, convinced she would always be fat. She blamed her childhood...her genes...even junk food. She was resigned to being plus-sized even though she secretly longed for something different. A single conversation 18 months ago put an end to that. Tory was told by one of her bosses at ABC that her clothes didn’t do her justice and she wanted to send Tory to a stylist. Even though the words “fat” and “lose weight” were never used -- nor was she threatened in any way -- Tory took away: lose weight or lose your job. In a flash, she realized she had to change for good and she was ready to do it. In the course of one year, Tory lost more than 60 pounds and discovered that what she put in her head matters more than what she put in her mouth, and in the process, she became a happier, healthier person. 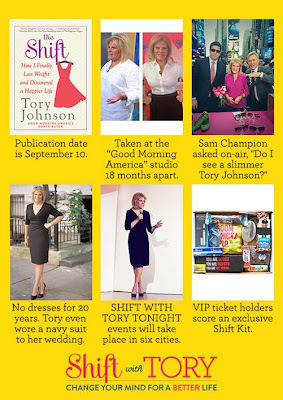 With her all-new book published by Hyperion on September 10, The Shift: How I Finally Lost Weight & Discovered a Happier Life, Tory is on a mission to help others change, too. The lessons she learned apply to anyone who feels stuck or stalled in tackling a big change in health, career or relationships. She's proof that the future can look a whole lot different—and brighter—than the past. Tory believes the time is now to make it happen. The Shift begins with this eye-opening incident and follows Tory on her amazing weight-loss journey. She creates a plan, makes a list of things she’s willing to sacrifice and teaches herself the realities of self-discipline. With disarming honesty, she shares her experience of overcoming inevitable challenges and roadblocks. In the end, Tory is not just a healthier and happier woman – but living a better life, too. For anyone who has struggled to make big life changes, The Shift offers valuable lessons and inspiration for taking charge – once and for all. “If I can do it, anyone can,” Tory says." Pre-order your copy of The Shift today at your favorite online retailer. Tory is hosting six SHIFT WITH TORY TONIGHT events. During these two-hour evening programs, she reveals her journey and her 5-step process for shifting. One lucky reader will win a SHIFT KIT, which is usually distribute to VIP Ticket Holders at the SHIFT WITH TORY TONIGHT events. To enter, please complete the entries on the Rafflecopter form below. Good luck! Nothing yet today just woke up and putting the kids on the bus for school.